The best tacos in Texas and possibly the best in the United States because Texas probably has the best Mexican food in the country (just guessing) are served at a Dallas gas station underneath a highway and nestled in a region that contains four liquor stores within two square blocks, along with a drive-thru daiquiri store. The place is called Fuel City and its tacos are authentic Mexican. And they are the best. This is not some assertion I have blindly tossed into the blogosphere as though my words were medieval flaming arrows peppered with significance. They lack all of those ingredients. But people with authority have made similar comments. 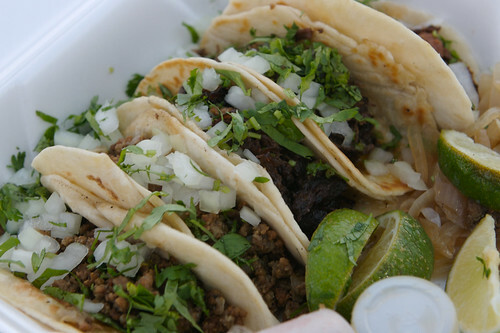 In 2006, Texas Monthly’s food editor called the picadillo taco the best in the state. This matters quite a bit. Many Texans believe in only three printed publications: the bible, Texas Monthly and any jumble of written words that bashes the Koran. So, yes, Texas Monthy writing to the state’s residents about tacos is akin to Paul penning a letter to the Philippians – IT’S NOT TO BE TAKEN LIGHTLY. When I moved down here, I quickly learned about Fuel City. I don’t scour the lesser known neighborhoods of the cities in which I dwell for the top eateries. I am one of those helplessly lame people who reads brochures and memorizes how many Yelp stars a restaurant has, and Fuel City has many of those stars, for good reason. The tacos, especially the picadillo, contain a mix of spices that blend perfectly with lime and salsa verde serve alongside them, and they always taste fresh, for the cash-only price of $1.40 each. The gas station features Mexicokes and tall-boy beers submerged in ice. Outside a vendor sells corn mixed with cheese and hot sauce. It’s also open 24 hours. So late at night, drunk, you can go to Taco Bell, McDonald’s or Fuel City, the lone option of the three where the meat is actually not made of processed cocker spaniel. I’ve been there late at night twice in the last month. That highway under which Fuel City is located is actually a crossroads of sorts. It’s where the South side really begins, where the gentrification of downtown and its neighbor Uptown starts to cede. Said geography leads to a wonderfully diverse set of customers all headed for the shared desire of those tacos, but the best part is that Fuel City, through price and quality, still caters to its neighborhood, to the working class that stopped by there for lunch long before anyone read about them on Yelp. But given its rising popularity – the magazine article from years ago, more honors from D Magazine and The Dallas Observer, actual billboards and advertisements that have gone up in recent months, a Groupon from last summer, talk that I hear from fellow Uptown yuppies – the balance is shifting. This means that the demise of Fuel City is possible. In Dallas, many people complain about a Tex-Mex chain called El Fenix. At least 10 of them are littered throughout the Metroplex. Their food is considered cookie-cutter, not genuine, not worth your time unless you have like seven kids and just have to take them SOMEWHERE. El Fenix, though, started out at an original location downtown in 1918. It must have been UNBELIEVABLE back then. It must have been the first time a lot of people ever tasted Mexican food, which is why it was able to expand to so many locations, why it became a chain. Dallas is a haven for original restaurants teeming with experimental tastes, if you are rich. If you are like me and have less money than a character Charlie Chaplin would have played (and not even a top hat to go with your disheveled clothes!) you lack options. We don’t have many of those original restaurants. We have Jack-In-The-Box and everything else. The name of the suburb Arlington is actually Spanish for “Land of 1,000 Whataburgers.” So yes, we know chains, expect restaurants to expand in the sprawl, even desire it. One reviewer on Yelp wrote this about Fuel City: “I wish they expand to a bigger place or something, more than just a gas station.” The SMU Daily ran a story about Fuel City last year and quoted a cop to ensure that the area is safe, or at least safer than the crime that happens around it. Part of me would like to see Fuel City expand solely for the benefit of the owners. The other part wants it to stay local, to stay in rundown areas where people must go out of their way if they want to discover the quality. I always hate it when people say they liked bands long ago before they were famous and then they get pissed when the band makes it big and their friends start listening to it. In that sense, my view is hypocritical. But it’s genuine. I want to eat delicious tacos, the best tacos, late at night, and I hope the only place I’ll be able to eat this exact kind is at a gas station. Thanks for leaving me craving their tacos! It’s been forever since I’ve made the trip up there. The American curiosity of excellent food delivered at gas stations must be vexing to visitors, especially from places where they don’t drive cars.